This fragment of a grayish marble slab was found in 1910 near Karantinnaya (Quarantine) bay and dated to the late 2nd century BC. "(...) When the citizens were driven back by enemies and asked him to restore defensive walls on his own expense, (...) the most convenient, (...) displayed great firmness, celerity, and zeal for the people (...) safety (...). In the same year, calling for ( ... ), he collected the money from the people ( ... ) and advanced against the fortress of Napites (...). 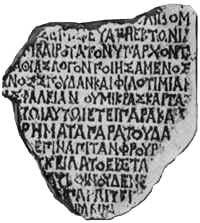 He promised that in the future would also act for the good of (...)"
This inscription informs about the Scythian fortress of Napites that existed in the Crimea. This fort is not mentioned in the decree for Dipohantos neither in the Strabo's Geography. The person who was honored by the decree both provided his fellow citizens with money to fortify the system of defense of Chersonesos and himself took part in military operations aimed against the fortress of Napites. Translation by © N. Khrapunov.